There’s something wrong with fishing in Europe. The thing is, over half of the fish caught in the North Sea end up being thrown back overboard, dead, the victim of a set of insane regulations intended to protect European fishery stocks, but which instead serve to decimate them. The basic thrust is that fishermen are given a certain quota of fish for each commercial species. They can fish for their quota, and land what they catch, but once the quota is filled, that’s it. No more fish of that species can be landed. The problem is that the North Sea is a mixed fishery, and fishermen can’t help which type of fish they catch. They may want haddock, but if they catch cod, for example, in addition to haddock, the cod can’t be landed if their quota of cod has already been caught and the only legal and realistic option is for the cod to be discarded at sea. Perfectly good fish – some of the best fish in the world, fresh, healthy, valuable – end up overboard, disposed of as ‘discard’ or ‘by catch’. This week saw the launch of Hugh Fearnley-Whittingstall’s Fish Fight, a campaign to challenge the legislation at the heart of the problem, the Common Fisheries Policy, which is due to be revised in 2012. The campaign doesn’t set out what it thinks should be done about the problem, which is perhaps a problem in itself – a campaign that isn’t clear and explicit about what it wants to achieve and how it wants to achieve it is on slightly shaky ground right from the start, but the central problem itself is absolutely clear – an absurd amount of prime fish ends up back in the sea, dead, and that’s shameful and unacceptable. Discard is a very complicated problem and there are many factors and variables that need to be accounted for, so a simple solution is unlikely to be either easy to find or perfect, but the fact that current legislation is both wasteful and morally wrong is indisputable. …this may sound odd, but there is method to it. Another angle that everybody can take part in straight away is diversification, eating more of the less popular fish species. Switching from cod or haddock to coley, for example, helps to create a market for coley that would otherwise be thrown away as rubbish in favour of cod and haddock, which along with salmon and tuna make up over 50% of all the fish we eat in Britain. Choosing coley, or mackerel, or flounder is an easy switch, and in many ways, these lesser-used species are superior to their more popular cousins – cheaper, tastier, easily available. There’s much to do to sort out this tangled mess of legislation, and it won’t be easy. 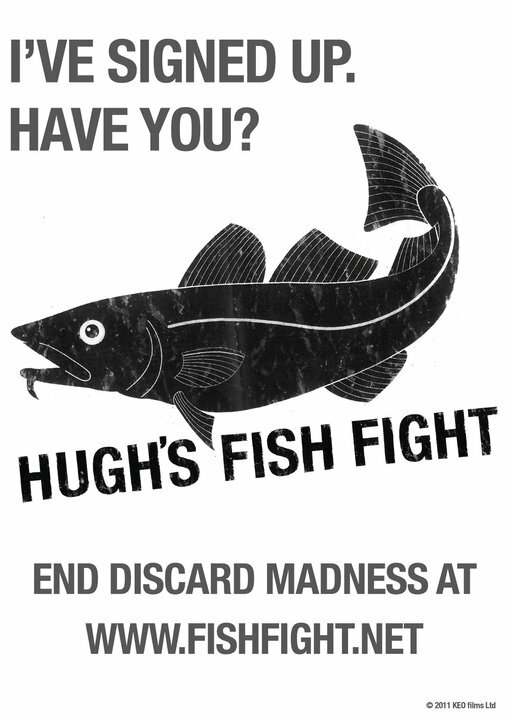 You can find more details about the Fish Fight here, or on Facebook or twitter. As an avid fish lover and consumer, I thoroughly support the Fish Fight. While we bemoan the lack of variety in the fish available for us to eat, a lot of perfectly good fish are being thrown to waste. I do do not find any reason why these fish cannot be offered to consumers or why people are not concerned about polluting the ocean. Discards, created by destructive fishing techniques and ineffective policy, are a key contributor to the depletion of global fish stocks. Additionally, illegal fishing activities – by unregistered vessels, illegal gear usage, or fishing in resticted areas – also have a massive impact on marine biodiversity, the livelihoods of fishermen, and the food security of some of the world’s poorest people.